Manager (Marketing) - 1 Post for UR General Non Priority - Basic Pay 9300 Grade Pay 4700 in Pay Band II category - MBA Marketing Management / PGDBM. Manager (Accounts) - 1 Post for UR General Non Priority - Basic Pay 9300 Grade Pay 4700 in Pay Band II category - CA / ICWA Inter qualified. Manager (Dairy Engineering) - 1 Post for UR General Non Priority - Basic Pay 9300 Grade Pay 4700 in Pay Band II category - BE / BTech Electrical Engineering / Electronics and Communication Engineering / Instrumentation Engineering / Automobile Engineering / Mechanical Engineering / Dairy Technology. 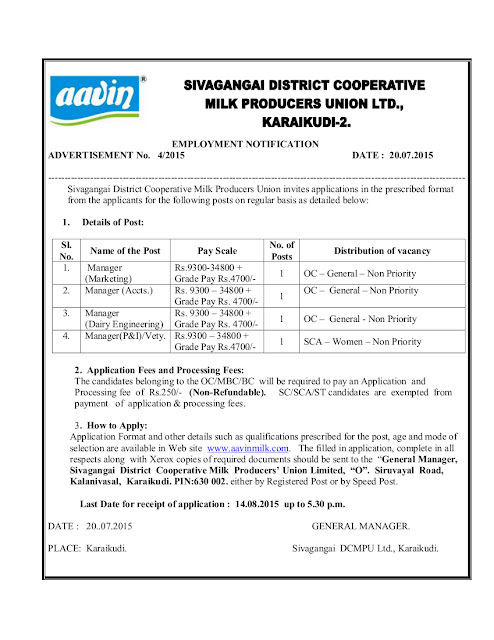 Manager (P&I / Veterinary) - 1 Post for SC Arunthathiyar Women Non Priority - Basic Pay 9300 Grade Pay 4700 in Pay Band II category - Degree in Veterinary Science BVSc. Application Fee FREE for SC / SCA / ST.